SJSU students race against other co-ed teams as part of the Concrete Canoe competition at the ASCE Mid-Pacific Regional Conference. SJSU students display their concrete canoe and information on how they built it at the conference. SJSU engineering students work on casting their concrete canoe. 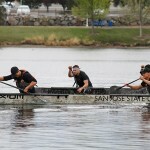 A team of SJSU students compete in a men’s sprint race with their concrete canoe. The team of paddlers who raced the SJSU Concrete Canoe pose for a photo. The full team of students who designed, built, presented and raced the canoe pose for a photo after taking second overall. 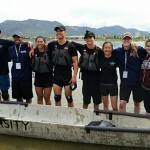 A team of San Jose State students from the Charles W. Davidson College of Engineering took second place overall in the American Society of Civil Engineers (ASCE) Mid-Pacific Regional Conference Concrete Canoe competition April 8 and 9 at the University of Nevada in Reno. The team was led by Hester Yu. 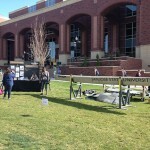 The conference includes competitions such as building a Concrete Canoe, a tradition in which civil engineering schools across the West Coast and international schools spar to create the best vessel. 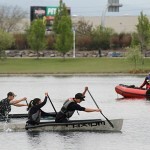 The ASCE Concrete Canoe competition challenges schools to design, build, present and race a canoe made of concrete. 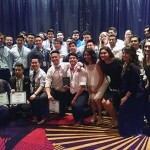 In addition to placing second overall, SJSU’s team placed second in final product, second in races and third in design report. The Mid-Pacific region includes fierce competition, but SJSU was able best competitors such as the University of California, Berkeley and Tongji University, from China. Working with Faculty Advisor Akthem Al-Manaseer, the Spartan team included more than 25 students from seven engineering disciplines who spent the school year designing, constructing and finishing their canoe. The team raised more than $9,000 from local sponsors, alumni and engineering firms for construction and material costs. The team’s canoe, Axiom, highlights the theme of geometry and recaptures the importance of building a strong foundation for future teams by focusing on the fundamentals. Barely missing a spot to compete in the national competition, the SJSU Concrete Canoe team is seeking to take center stage again next year. The team is working once again to secure resources and sponsorship while recruiting members for next year. To learn more about the team or to see the canoe, email canoe@sjsuasce.org.